TSN today announced their newest partnership with Advil which will take NHL fans inside the game like never before with the TSN GameTracker. 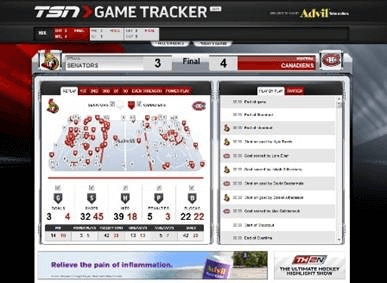 The sports network’s newest digital platform is available at TSN.ca/GameTracker. Sponsored exclusively by Advil, the TSN GameTracker offers site visitors second-screen, real-time access to in-depth stats and detailed game and player analytics for every NHL match-up, including goals, shots, hits, and time on ice. The TSN GameTracker also has an interactive display that plots each stat on a virtual ice surface – where and when it happens.